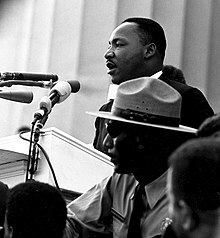 In all the celebrations going on this week, no one has noted the irony that Dr. King was often at odds with the federal government, as well as a lot of state governments. Only fifteen months after Dr. King’s famous speech at the August 28, 1963 march and rally, FBI Director J. Edgar Hoover told a group of women reporters that Dr. King was "the most notorious liar in the country." This came in reaction to newspaper reports of a mild criticism by Dr. King of the FBI’s handling of civil rights complaints in the South. Indeed it was that very march that convinced Hoover that Dr. King and the civil rights movement were serious threats to his America. He shifted the Bureau’s policy from observing the movement while providing information on it to local law enforcement in the South, into actively undermining it. Dr. King was his primary target. At Hoover’s direction, the FBI not only harassed Dr. King, but did not even warn him when it knew of threats on his life. I was not at that now famous march 48 years ago; I was still a college student on the west coast. But that fall I was one of hundreds, thousands, of students to become active in the civil rights movement all over the country. After graduating from Berkeley in 1965 I went South to work for Dr. King’s organization, the Southern Christian Leadership Conference (SCLC). In my 18 months with SCLC I worked mostly in Alabama, but also in South Carolina, Mississippi, the Atlanta office and Chicago. After Dr. King was killed on April 4, 1968, I hitchhiked from Chicago to Atlanta because I needed to be present at his funeral. While welcoming the memorialization of Dr. King at the seat of our national government, we should not forget that it and the civil rights movement had a very uneasy relationship. The movement’s goal was a fundamental change in our culture regarding race. Presidents Kennedy and Johnson agreed on the need for change, but it was not a priority. They were quite aware that most of the important Congressional committees were chaired by Southerners who could hold up their other proposals if they pushed the envelope on race. Within the Department of Justice, movement demands created a contradictory response. Attorneys General Robert Kennedy, Nicholas Katzenbach and Ramsey Clark were sympathetic. FBI Director J. Edgar Hoover was not. Technically, Hoover reported to the A.G. Realistically, he had his own empire. A.G.s came and went. Hoover had been in charge of the Bureau since 1924; by the 1960s forty percent of DoJ personnel reported to him and he had extensive files on all the politicians he worked for, with, and against. Hoover worked very hard to keep his people loyal to him, diligent in pursuit of his goals, and distant from the rest of the DoJ. To further the cause of civil rights the A.G.s went around the FBI, using attorneys in the small Civil Rights Division to do much of the investigative work that should have been done by FBI agents.